We all know someone with arthritis, or maybe you are a sufferer or are newly diagnosed. Depending on the type of arthritis, you have come to realize that living with arthritis is uncomfortable and will affect your everyday life. A general definition of arthritis is an auto-immune disease that causes inflammation of a joint. According to www.cdc.gov, the term arthritis is used to describe over 100 different diseases and is one of the most common diseases afflicting millions of Americans, spanning every age group. Every joint in the body consists of two bones joined together by tendons, ligaments, and muscles. Each of these bones is capped on the end with cartilage to protect the ends of the bones. Surrounding the joint is synovium, a membrane that produces a lubricating fluid (synovial fluid). Synovial fluid provides a cushion, along with cartilage, protecting the joint from friction, wear and tear. When there is damage to the joint, usually to the cartilage, the bones protection is gone, causing pain, stiffness, and inflammation. This damage can occur for a variety of reasons like trauma or age. 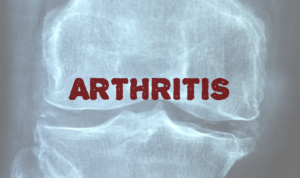 Each type of arthritis has varying signs. Also, the symptoms of arthritis are similar to the signs of other diseases such as Lyme disease. So it is important to receive a proper diagnosis to determine the type of arthritis and to receive proper treatment. If you are experiencing joint pain, stiffness, redness, warmth, or swelling of the area for over a week or more, you should see a doctor. The doctor will do a physical exam, review your history, blood work, and x-rays. It is important if known, to share your family history, as some forms of arthritis have a hereditary link. Arthritis is typically treated with over-the-counter anti-inflammatory medications. Doctors can also prescribe medications to treat the inflammatory pain of arthritis not managed well by over the counter medications. Hot and/or cold compresses work for some people. Some doctors prescribe surgery or physical therapy (exercise) to treat arthritis. Again, your doctor should properly determine the type of arthritis and therefore the type of treatment modalities that could assist with your symptoms. I say assist because there is no cure for arthritis. Because there is no cure for arthritis, for many, the realization is that there will be a degree of pain and discomfort in daily life, and you must learn how to adapt to it in order to live your best life.